I don't know, but I will tell you that I spent yesterday in bed and when I finally felt like emerging last night I did not feel like cooking. I felt like some short cuts. And I felt like some comfort food. So I grabbed a can of navy beans and a can of collard greens and started searching online for a cornbread recipe. I'm pretty partial to cornbread (or anything else for that matter) made in a cast iron skillet. It's how my step-mother cooked a lot of her food and it's how my sister cooked a lot of her food, so the skillet is as much comfort to me as what comes out of it. Plus, it's always in the back of my mind as a weapon in case of an intruder. I added "skillet" to my search terms and started down the list and saw Veganomicon listed as a source. Duh, why didn't I just check my own books first? I have that book and I haven't even made a single thing out of it, yet. The recipe called for a 9-inch pan, but I only have a grill pan, dutch oven (that possibly would have worked), 6-inch (my baby!) and a 12-inch. I cut the recipe (which appears here on Rebecita's recipe blog) in half and it worked perfect. I did the double corn version. My kid is allergic to corn and he was with his dad last night, so I felt like I needed to just blow it out. It's such a rarity around here. The beans I get are just Bush's. They don't have a lot of crap in them (no meat flavoring, watch out for that) and the salt isn't too bad when you figure it's feeding me and boyfriend, plus leftovers for boyfriend tomorrow. Some canned beans I end up rinsing to get some of the salt out, but these don't need it. I actually ended up adding a little more salt and I'm historically NOT a salter. I didn't drain the fluid at all because I wanted some bean "gravy." I added a little bit of Earth Balance, some black pepper and just the tiniest smidge (like, less than 1/8 of a teaspoon) of Wright's liquid smoke (so far the only brand of liquid smoke I like AT ALL despite the picture of the steak on the front. I'll just cover that with some masking tape). Canned collard greens are a label-reading game, too. Many of them have meat in some form. Some have stuff like MSG and loads of other questionable bits. I've found that those that are seasoned are super high in sodium and I don't really even like the taste anyway. So, what I do is get the blandest can I can find. Just collard greens and water? Hell yeah. I use Margaret Holmes unseasoned. They make kale greens and others, too. Super bland but I like a blank slate. So, I fry up half an onion in some canola oil and add red pepper flakes and garlic to the oil and stir for about 30 seconds to a minute once the onions are done. Then I add like 2 tablespoons of dark brown sugar to that and stir it around till the sugar is all melted. Add black pepper and a little salt and dump the can of greens in and stir well. Add a smidge of liquid smoke and stir, then cover and let simmer very low until the cornbread is done (or about 15 minutes). Don't drain the collards so you'll have some potlikker. When the cornbread was done and had rested a few minutes, I cut it into wedges and then smothered it with beans. Next time, I may just bake the cornbread right on top of the beans. You just heat the beans and season them how you wish, pour them in the skillet and then pour the batter right on top. It takes about 5-10 minutes longer to cook and you get a bready layer on top and a sort of tamale-like layer in the middle. Super yum! My first recipe from Veganomicon has been a complete success and was a vegan replacement for what used to be a pretty pork-laden dish all my life. Comfort food. Saturdays at the American Legion Children's Home. Sweet, predictable comfort made so much better. Update 4/11/2011: I made the "basic" version of this and it turned out yummy, too (see pic below). Cutting this recipe in half and using the small skillet is the way to go for us, though. I don't know what I would do with all that cornbread if I made the whole batch. I really, really like that cornbread!! Very yum. I've made that before. I really want a cast iron (they are supposed to help you get iron too!) but am a chronic second hand shopper and I assume they were all seasoned with meat. I can't wait for you to try more from veganomicon, it's so great!! Veganomicon really rocks. 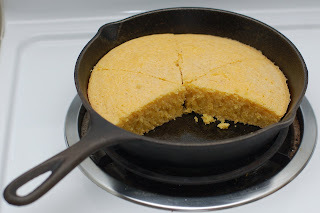 I love the skillet corn bread and have done it at least 10 times already... i never thought about cutting it in wedges and mixing it with food. What a great idea. Thanks! Yes, so you do know Veganomicon. Great cookbook. I love the chickpea cutlets and the black beans with adobe sauce. Mmmmm.